When EUW was founded in 1953, the principal aim was to encourage European women in different countries to study and resolve common problems. EUW believes that women should be encouraged to play an active part in civic life, and membership includes business and professional women, MPs, MEPS and local Councillors. EUW maintains regular dialogues between the National Sections through the work of the EUW Commissions and the visits organised by Europe Alive. Particular attention is paid to issues that concern the European Parliament, the Council of Europe and the United Nations. The International Council meets biannually and comprises the Executive Committee, three members of each National Section, the Chairman and Vice Chairman of Commissions, the representatives of EUW at the Council of Europe and the United Nations’ special Committees and the auditors. The International Executive (responsible for the realisation of the aims of EUW) is composed of a Chairman, Vice Chairman, Treasurer and the Chairmen of the National Sections and a General Secretary. The Executive meets twice a year and elections are held every two years. The Commissions bring together professional women experienced in many different disciplines. 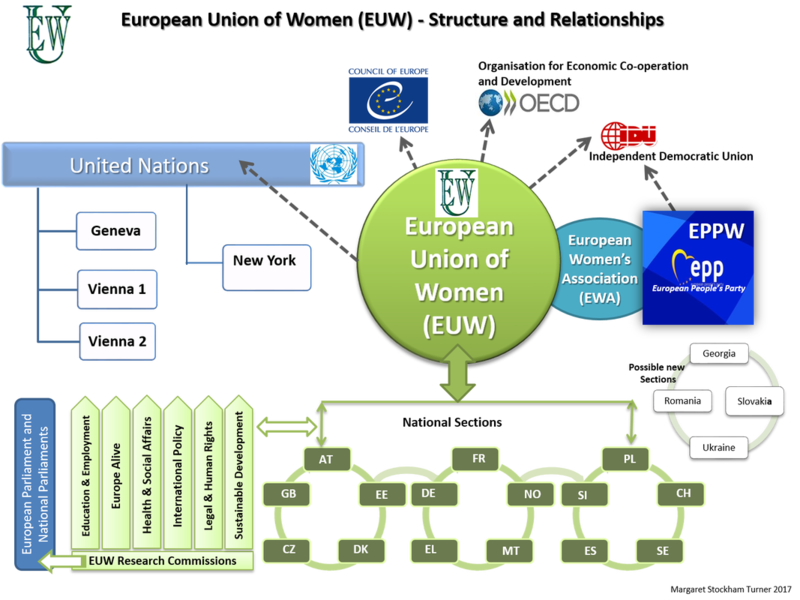 The European Women’s Organisation (EWA): Five members of the EUW International Executive Committee are Board members of EWA. 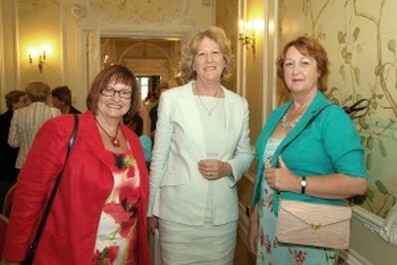 Five other Board members of EWA are members of the EPP Women’s Section Executive….. The Management Committee of British Section comprises the officers and the Regional Chairmen. The Management Committee meets four times per year. The Council of British Section comprises those on the Management Committee, branch chairmen, Commission leaders and full members, and those with special responsibilities. The Council meets twice a year, one of the occasions usually being during the Branch Chairmen’s Break in the spring. The Fund was established in 1988 on the initiative of Angela Guillaume (International Chairman of EUW from 1993 to 1999) to commemorate the founder of EUW. When the Berlin Wall fell, many women came to know freedom for the first time and wished to ensure that they and future generations could live under democratically-elected governments. These women have the spirit, the talents and the determination, but lack the means to produce literature, organise meetings or travel. Identifying and supporting these women is the aim of the Fund. At International Council Meetings and General Assemblies over the years, there have been representatives from the already established Sections in Estonia, Lithuania, Poland and Slovenia and observers from Albania, Bulgaria, Macedonia, Romania, Slovakia and the Ukraine. All these women, together with women from the Czech Republic, Croatia, Latvia and Russia have been helped by the Fund. The Fund is supported wholly by donations. These come from branches in British Section and other natonal sections and by the proceeds of an annual lottery held at the International Council Meeting and by other donations. In the past, Courses have been held by British Section for women in Belarus, Bulgaria, Estonia, Lithuania, Macedonia, Poland and the Ukraine. Funding has been provided by the Westminster Foundation for Democracy with the courses organised and implemented by EUW British Section members. Recently the British Section have hosted women from Eastern European countries in the U.K.for information visits covering British democratic institutions, Local Government and Civic life, under the auspices of the Westminster Foundation for Democracy. In 2010 EUW hosted two groups of women from Macedonia, Serbia and Montenegro who came to the UK as Observers of our General Election.